I have to admit that when the weather is cold, when nothing sounds better than staying in bed all day: a bowl of thick, hot porridge really hits the spot. Now, what if I tell you that you can add some seafood to the porridge, and this recipe method lets you enjoy this dish quickly on those mornings you don’t want to get out of bed? You must ask, is there such a good thing? The following method of seafood porridge is the result of my many experiments. 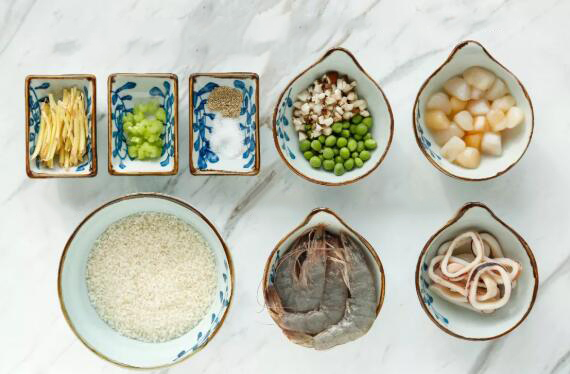 In the shortest time, with the most simple ingredients, this super delicious seafood porridge will warm your heart on soul on the coldest winter days! Seasoning: Salt and white ground pepper to taste. The most important thing about seafood congee is the porridge. It is very important to soak the shrimp oil into the rice to give it a chance to absorb all the flavor. This step is very important! Step 2: Add ginger to the rice water, turn the heat to high. After the water begins to boil, turn to low heat and stir to avoid rice sticking the bottom of the pot. Step 3: Whilst the rice simmers, remove the shrimp shell and the veins, prepare the calamari and fresh scallops for use. You can choose the seafood and vegetables that you prefer. I, personally, use the ingredients in this recipe, but you can continue following the same steps using your own if you like. Step 4: After the rice has started growing, add shrimp, calamari, and fresh scallops and simmer, stirring frequently. Step 5: After the seafood has cooked (the shrimp will have turned pink and begun to curl), add celery, peas, and mushrooms. Cook until the vegetables begin to soften, stirring frequently. Step 6: Before serving, sprinkle salt and white ground pepper according to your taste. If the rice is soaked for 1 hour in advance, cooking time simmer rice will be 40 minutes. If the rice is soaked one night in advance, only 20 minutes will work. This will ensure that your end product is as close to the same textures as possible. What pot is suitable for cooking porridge? I recommend using a pot with a thicker wall. Like the casserole is recommended. The insulation effect is good to keep warm for longer. How much water is most suitable? Because rice is soaked in advance, it is easy to cook the rice, so the amount of water is 6-8 times that of rice. What else can I put in addition to the ingredients in the recipe? 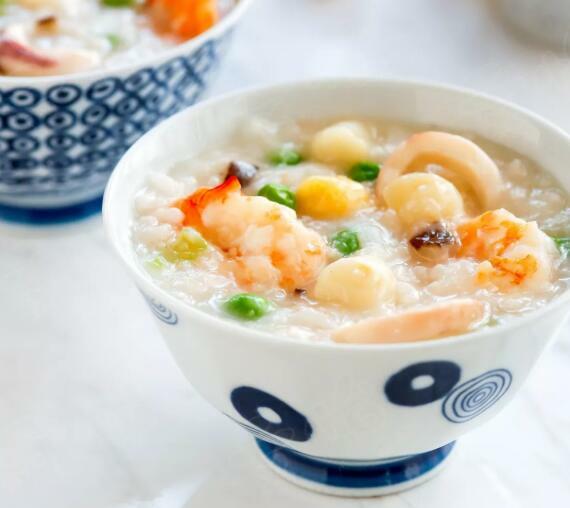 Take the most common shrimp and crab porridge as an example. The main ingredients are crab and shrimp. You can also use winter vegetables, shiitake mushrooms, rapeseed and parsley. In order to save time, I use Scallops shellfish and calamari. You can also use dry seafood, but you need to soak them in advance. Ginger is also essential, it brings all the flavors together. I also prefer white ground pepper than black ground pepper, it is smoother for this type of dish.